Figure Nineteen.- Beneath the Remnant Veil. 2009-2016. 4'h x 32”w x 5.5”d. Bronze, Wood, Resin, Acrylic, Gold leaf, Silk, Hardware. Now that it's finished, it's hard to believe this sculpture was started nine years ago. 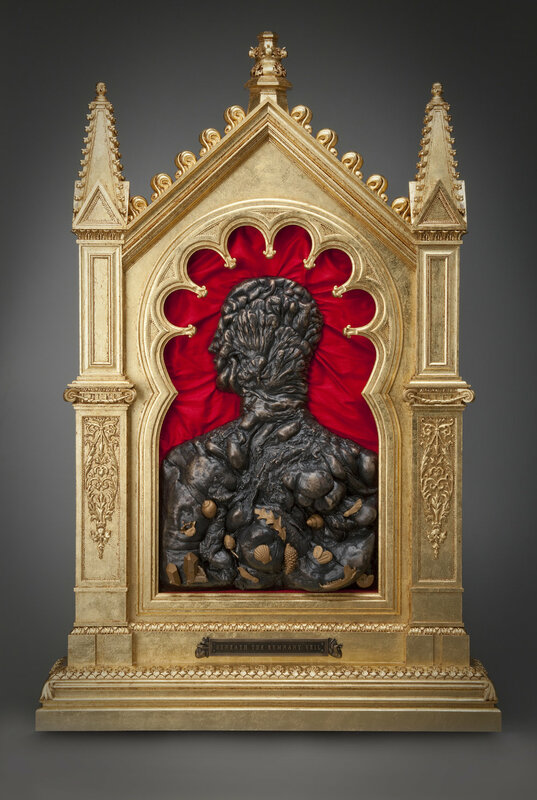 From the onset, this work was to be a blend of reliquary and anatomical display, but it went through many changes over the years. Design elements of the frame were referenced from Gothic sources, with everything sculpted and fabricated in my studio. The central figure is bronze, and is to evoke the wax anatomical models of the past. Where those displays were dissected and clean, the human object here is bulbous and nearly unrecognizable, yet it was my intention to make it elegant still. This figure, and the objects tucked within it, are remnants of something once alive and vital: earth, land, and sea. Beneath the Remnant Veil, detail.